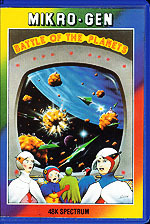 This videogame produced for Sinclair's ZX Spectrum computer system was interesting for two main reasons; First, it was the sole videogame created for Battle of the Planets, but it was also one of the last licensed products from the series' original line of merchandise. The game was later re-released in two additional "best of" type packs, "Classic Collection 1" and "Four Great Games Volume 2," both in 1987. To see the game's original artwork, click here. 1985, by Mikro-Gen.